The flora and the fauna of the region are lush and worthy. We can see many and dense forests both at Zagori and Konitsa. 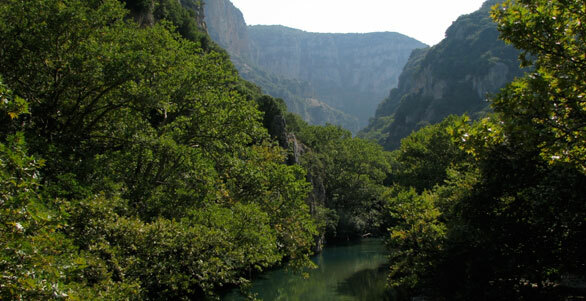 The riparian forests of Voidomatis and Aoos at low elevation and the small hypalpine lakes, like Drakolimnes of Smolikas and Tymfi, nearby the summits of the mountains, which give rare beauty in the wild landscape, are very attractive. In the region there are 1700 species of plants, many of which are pharmaceutical. This thing couldn’t be left unnoticed by the residents of Zagori. Thus, since 17th century, Zagori was the birthplace of a special professional team of botanical therapists, the Vikodoctors. In the region we can meet almost all of the species of rare and protected wild animals, like bear and wild goat. It is characteristic that half of the 700 wild goats, which exist in Greece, live here.